In the summer of 2008 a few, short, video clips of an acoustic jazz duo received over 100,000 views on YouTube and the attention of American Express with regard to an advertising campaign. The combination of the English born bassist Peter Williams (known for his contribution to Woody Allen’s Grammy winning soundtrack for Midnight in Paris) and Danish vibraphonist Jacob Svensson had some serious appeal. With Jazzy Shorts Peter Williams has composed a collection of original tunes to explore the sound-scape that such an exposed and somewhat eccentric combination of instruments makes possible. 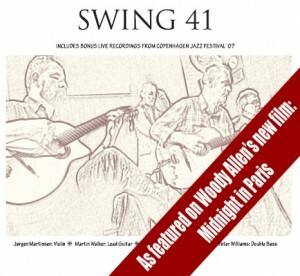 This collection of classic Gypsy Jazz standards was brought to notoriety by Woody Allen who, in 2011, chose to use the recording of Je Suis Seul Ce Soir from this album for his box office hit Midnight in Paris. The soundtrack from the Oscar winning film went on to win the Grammy for best compilation soundtrack 2013. The album includes both studio and live recordings from this Copenhagen based quartet.